So tomorrow I plan to cook rice in my brand-new Wonderbag, using Veggie.Buntch’s useful ‘I love the Wonderbag‘ posting as a guide. Then there’s this interview with Margot Janse, on how to cook samp — or African risotto, as she calls it. I am super-excited to be attending her demonstration as part of the Cook Franschhoek festival in June. • 2 medium tomatoes, diced for garnish. Curry paste: Mix all ingredients together in a blender until a fine paste. It will taste very strongly of lime but will soften in the sauce. Haloumi: Cut haloumi into 2 cm x 2 cm pieces. Fry in a non-stick pan on either side, no oil is needed. You may have to do this in a few batches. Curry: Fry the onion, ginger and 2 tbs curry paste in a small amount of oil until translucent. Add coconut milk, veggies and coconut cream. Bring to a boil and keep at a high heat for about 5-10 minutes. Pop in the Wonderbag for an hour. The curry will be hot enough to serve, but you can bring to the boil again if veggies are not soft enough for your taste. Add additional curry paste to taste. Stir in the fried haloumi. Serve with rice and fresh tomato sprinkled on top. Today, I bought a Wonderbag on my way to the Recycling Depot. It all felt very Capetonian. My best intentions usually come to naught. But I do plan to make my own bread (according to Rob O’Donoghue’s recipe sourced from rural Eastern Cape women), my own yoghurt (inspired by my ex-neighbour, Harold Gess, the beautiful thermometer I bought from the Rhodes’ Chem Lab for R27 and a glorious posting on Salon.com) and to cook samp just like Margot Janse. To do first: Preheat oven to 180 deg C.
Butter a medium-sized, deep springform pan. For the crust: Crush half a packet of ProVita (or digestive biscuits) and mix in some melted butter. Press into the base of the springform pan. I used the back of a spoon to do this. Put in the fridge. For the filling: Chop up some butternut (or open a packet) and two onions and a clove or two of garlic. About half a large roasting pan’s worth should do it. Add some fresh sage leaves and drizzle over olive oil. Roast at 180 for about 30 minutes or until soft. Once cooked, set aside to cool. In a large bowl, mix 1 tub of creme fraiche and 1 tub of cream cheese. In a separate bowl, beat four eggs. Add to cream mixture and mix well. Put it all together: Now put a layer of cooled butternut mixture into the pan. Then top with about 1 round of crumbled feta cheese and add egg/cream mixture. Place in centre of oven and cook for about an hour, or until quite golden and set. To serve: Garnish with some fresh sage leaves and allow to cool a little before slicing. It is also good at room temperature. I wish I’d taken a photo. Peter Bruce, the editor of Business Day (and a former sub-editor, which means he understands the trenches only too well), wrote a great column in Monday’s newspaper about how a “reporter with a great news story” managed to get The Weekender a world exclusive, breaking news of the ANC’s decision to recall President Thabo Mbeki. Although they had already put the paper to bed on Saturday night with an inconclusive, ho hum Mbeki story, political editor Karima Brown responded to an SMS sent at 1am carrying news of the NEC’s decision. This was the biggest South African news story since the fall of apartheid. Hell, how could she let her paper miss it? Just brilliant, writes Bruce. And I have to agree: this is the kind of thing that could only happen at a newspaper. Just brilliant. By the way, if anyone out there cares to do a search to find out when this news hit the web, let me know who got it first. This may just turn out to be a case of “print got it first” and that would delight an old codger like me who is nostalgic for the adrenaline of a newsroom. A very cursory browse of online archives shows that IOL’s first confirmation story ANC officially asks Mbeki to go was posted at 9am on Saturday. News24 had a tentative Mbeki asked to resign? at 11am, while the M&G had ANC dumps Mbeki, moves to ‘heal rift’ at 1.30pm. The Times website had been reporting from about 5pm that the NEC had already decided Mbeki must be axed. They were quoting Sunday Times staff. It looked to us like an inspired guess. Despite our best efforts, we hadn’t been able to confirm that fact ourselves. Once again, I’m reminded that the Weekender’s scoop was only possible because there were experienced hands at the helm who had the right contacts, who could trust the information being sent through and who had enough experience to change an “inspired guess” into an on-the-record, confirmed story. Copy editors might be the only people who can discuss, cheerfully and seriously and on their own time, when to hyphenate a compound adjective. Normal people, I have found, deeply do not care. Sub-editors are not normal people. So reading, writing (and thinking about writing) is a crucial component of the sub-editing course I am teaching to fourth-year Journalism and Media Studies students at Rhodes University. And, really, I’m discovering that the best way to encourage this is by blogging. Last week, the students set up their blogs, which they will run for the duration of the course. I’ve aggregated them all under one banner (I heart WordPress! ), including each of the student’s contributions as RSS feeds. Have a look at the classblog and let me know what you think. I have started teaching a six-week course on sub-editing to fourth year Journalism and Media Studies students at Rhodes. It’s a small group of women who have chosen to do the course for very different reasons. It’s exciting and nerve-racking at the same time. I know I have as much to learn from them as they do from me. Sub-editors have always been my favourite people in a newsroom. Generally, they’re quirky, clever, curious — and totally unhinged. In preparing for the first session, I spent some time thinking about the role of sub-editors and how that is changing as media consumption patterns and news change. There’s a lot happening out there that challenges my thinking that subs are essential parts of the editorial process. But that’s material for another posting. After working on and off as a sub-editor for 16 years, I like to think that there are some lessons I have learnt along the way. Clive Lawrance (yes, that is how you spell his surname) co-taught this course with me a few years back. A crusty newsroom curmudgeon who commanded respect and excellence, he liked to warn of three things that stand between a writer and good writing: vanity, fear, laziness. Most of the lessons below fall into one of these categories. You may be able to fix or improve someone else’s writing, but that doesn’t mean you know more than them. Subs’ rooms and newsrooms are filled with interesting people who know a lot about a lot of things. Learn to listen. And look up whatever you don’t know. There will always be a reader who knows the subject better than you. Sub-editors may be the “unsung heroes of journalism”, but adversarial relationships between writers and sub-editors serve no purpose. While our job is to get it right and make writers look good, it’s worth remembering that subs can also mess up a story. A little humility goes a long way. Clive used to quote Uys Krige as saying, “To be a great writer, you need to read the great masters. If you’re not reading, then you should be writing. And if you are not writing, you should be thinking about writing.” Make reading a habit. Read newspapers. Read magazines. Read whatever you can lay your hands on. Be curious. Be interested. Be interesting. Simply punctuating correctly can restore sense to a sentence. It’s not rocket science. Teach yourself how to do it well. Avoid changing anything without a good reason. Fix mistakes, but don’t beat a story into submission. There are many reporters whose first language is not English. Help craft the story, don’t destroy it. Not every story you touch needs to be reworked into your style. “Thou shalt not sub what thou don’t understand,” one of my favourite chief-subs once admonished me. We should always be asking questions because we don’t have all the answers. Use the internet. Don’t leave home without your dictionary. Find out how things work and how to do stuff that will make you a better journalist, like working with pictures and audio, basic HTML. Curiosity is a n essential characteristic for the job. Know what it’s called. Know the keyboard shortcuts. Work fast. Work neatly. Look like you know what you are doing. If you don’t like it, leave it. Like what you do. Hell, love what you do. Otherwise no job is worth it. Especially on the nightshift. Vanity, fear, laziness. Beware the three deadly sins of journalistic life. 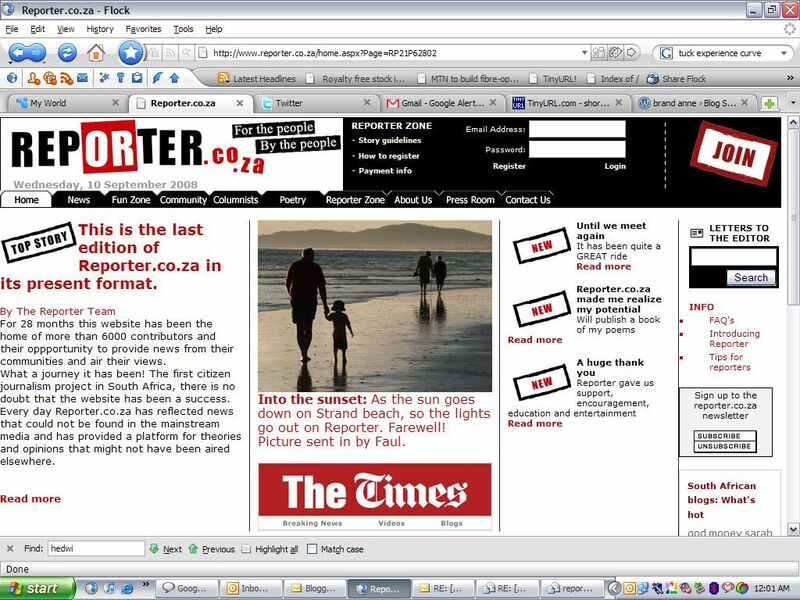 This evening, I picked up on Twitter (via @ricegirl2 – Sarah Rice) that Reporter.co.za is closing, on the last day of Highway Africa 2008. I could be wrong, but I think reporter.co.za was the first and only standalone citizen journalism attempt by mainstream media (Avusa). Terribly ironic timing, if you ask me. I believed Gillmor, Buckland and others at the conference when they said that journalism as we know it has been forever altered by the rise of citizen journalism or participatory media; that there has never been a better opportunity than now for “journalistic entrepreneurs”. But reporter.co.za is closing after more than two years of publishing. According to the closing note on the site, more than 6 000 contributors have posted to the site. They say the site “has to be transformed to adapt to new technology”. No surprises there, I guess, as there is no scope for multimedia files and the site does have a very old fashioned feel to it. Perhaps Avusa is trying to align its online products and create a little synergy between the different platforms and titles (which seem fiercely and needlessly competitive from where I sit). It would be incredibly useful and interesting if there was some public discussion around the strategy that went beyond the middle-of-the-road “farewell, thanks for changing my life” stuff currently on reporter.co.za. I can’t see reporter.co.za making any kind of comeback but, perhaps, its demise will create space and opportunities within the traditional titles for readers and citizen journalism that go beyond comments and “send us your photos” buttons. Let’s hope someone at Avusa has been paying attention and that the lessons from this social experiment have been learnt. I guess we’ll just have to wait and see. Receipt: pour the content of the packets on a slau firefor about 15min. After the water ie evaporated add 5/6 oil tablespoons and fry for 2/3 min. The add cook for 20/30 min. More. Meanwhile, cook spagetthi al dente, drain and stir in the pan on a hot fire. Talking of recipes, we had our dinner club this weekend, hosted by Olaf and Michelle. It was an amazing evening and I had a blast. With a Chinese theme, Olaf pulled out all the stops (four-dish main course) and we laughed and laughed and laughed. I made Wonton Soup, which was delicious. My fresh spring rolls were a little less spectacular (and, in truth, much too Thai to be passed off as Chinese…) There’s something very calming to folding little dumplings while listening to music from a past life, like Morcheeba. Apparently “wonton” is derived from the Cantonese word and translates to “swallowing clouds”. Soak mushrooms in hot water to cover for 30 mins. Darin, squeeze to remove excess liquid. Remove stems and chop the caps finely. Thoroughly combine mushrooms, pork, prawn meat, salt, soy, sesame oil, spring onion, ginger and water chestnuts. Cook wontons in rapidly boiling water for about 5 minutes. Bring stock to boil in separate pan. Remove wontons from water with a slotted spoon and place in a serving bowl. Garnish with extra spring onion and pour the simmering stock over. Serve immediately. * The 250g pack of wonton wrappers contained about 30 wrappers. I made one-and-a-half times the recipe, but used two packs of wonton wrappers – around 64 wontons. I’ll be posting some more recipes and pictures to the BFM Dinner Club group on Facebook sometime this week. Now that I live in Grahamstown, I am learning to cook. I have to. I bake biscuits (gasp!) when friends come for tea. I make things to take along to other people’s parties. The other day I even made mayonnaise. From scratch. These are the lengths that deprivation has led me to. If I still lived in Joburg I would have just stopped off at Koljander, the world’s best tuisnywerheid in Melville, or at Woolies. Sigh. One of my kids’ party standards these days is mealie bread. Taken from Gabi Steenkamp’s Sustained Energy for Kids, I’m gobsmacked at how many times I get asked for this recipe. I think there’s something about mealie bread that reminds people of their childhood. Anyway, it’s dead easy and worth sharing (even though it’s made in the microwave, which I usually avoid). It’s also eaten and enjoyed by everyone else’s kids except mine. The trickiest part is finding a microwaveable ring dish. Grease microwave ring baking mould with a paper towel dipped in oil. And sprinkle a little paprika into the mould (I have never bothered to do this). Mix all the dry ingredients together in a medium-sized mixing bowl. In a separate bowl, mix the oil, eggs and milk together well and add to the dry ingredients. Add the sweetcorn and the parsley, if used, and mix well. Spoon into the microwave ring and microwave at 70% power for 12 minutes. Then at 100% for 2 minutes. Allow to stand for 10 minutes (to finish cooking). Turn out, slice into about 20 slices. I can pretend to be interested in things like newspapers, media, and other heavyweight issues but, really, all I care about is food. Since moving to Grahamstown three years ago, I have become seriously obsessed – especially as there is no Woolies food (gasp! ), and a seriously inconsistent supply of even the most basic ingredients. Last week, there was not a single packet of frozen peas to be had. And I wasn’t even looking for petit pois. Frozen peas. It has come to this. My children have been off from school since their teacher fell ill in June (yikes! ), so we’ve been spending quite a lot of time playing with friends, eating and drinking. Today, Nina made some lemonade (her own recipe with a found “squishy” lemon from the garden) and then we all made fizzy orange using Tessa Kiross’s recipe. It was seriously delicious and the children – all five of them, age three to eight – loved it. We dubbed it orangeade. Put sugar, orange rind and water into a small pan. Bring to boil, stirring so that the sugar dissolves completely. Boil for a few minutes so that the rind flavours the syrup. Add freshly squeezed orange juice and let that bubble for about 5 mins, or until it looks slightly denser. Pour into a jug and let it cool completely. When you’re ready to serve, pour in sparkling water and mix well. Add ice if you like. Tessa recommends that you add spices, such as a vanilla bean or a small stick of cinnamon, if making it for adults.